The content displayed here is for informational purposes only and is considered by American Foreclosures, Inc. to be reliable, although inaccuracies occasionally occur. American Foreclosures, Inc. assumes no responsibility for inaccurate information nor the way in which any of the information on this website is used. 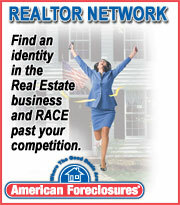 The website is updated daily, however, the availability of real estate listings changes rapidly. Therefore, some information may be out of date. The website is updated daily, however, the availability of real estate listings changes rapidly. Therefore, some information may be out of date.